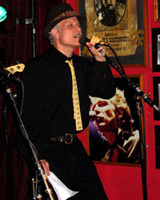 Kenny’s Castaways, 157 Bleecker Street in New York City was the place to be for Blues and R&B lovers, to celebrate the talent, artistic contributions and legacies of over a dozen legends of the New York Blues scene. 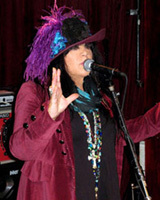 Hosted by Roxy Perry, the room was packed throughout the five-hour program, which featured performances and Blues Hall of Fame inductions for the stellar roster of New York artists, who in order of appearance, were Charles “Honeyboy” Otis, Robert Ross, Arthur Neilson, Michael Powers, Big Ed Sullivan, Roxy Perry, Michael Hill, Ivan Bodley, and Angel Rissoff. 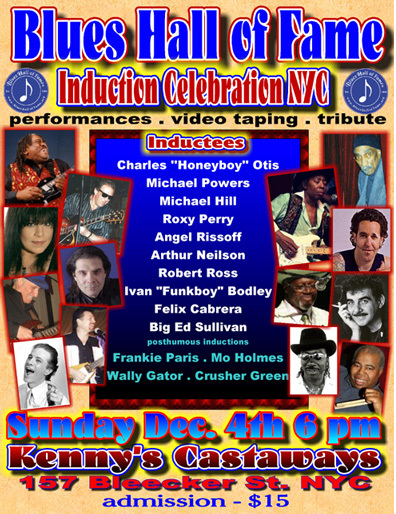 Also on this night, special tribute was made to honor the contributions of four New York greats, posthumously inducted into the Blues Hall of Fame. 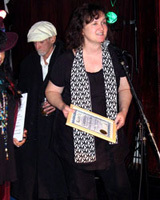 Certificates were accepted amid cherished remembrances, admiration and respect. Drummer, Wally “Gator” Watson’s wife accepted the induction on his behalf. 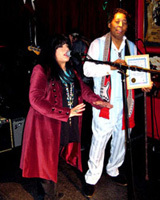 Jerry Dugger received the induction certificate on behalf of R&B vocalist, Moe Holmes. 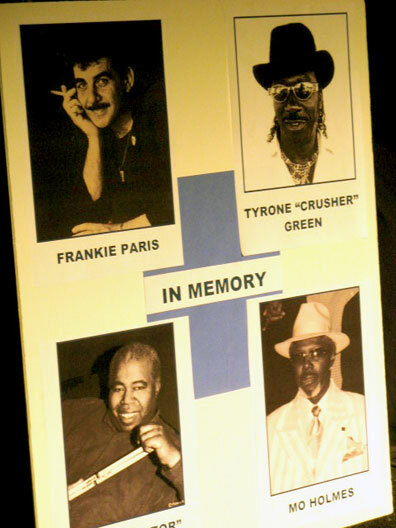 Marsha Mayer accepted on behalf of drummer, Tyrone “Crusher” Green, and Tony Spinale on behalf of his father, R&B vocalist, Frankie Paris. 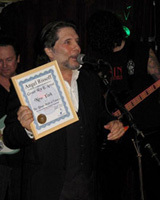 A special tribute set in memory of Frankie Paris was performed by honorees, Angel Rissoff and Ivan Bodley. Host, Roxy Perry, stated that the intent of the day was to recognize the amazing music, energy and talent shared by all the honorees, and for those colleagues present, to take time out and share the enjoyment of the moment. Her message hit home when news came that yet another guitar legend, Hubert Sumlin, had passed away just hours before. The room fell silent as the audience – so many of whom were colleagues, friends and fans of Sumlin, paused a moment for reflection and prayer. The show continued with a deeper sense of purpose and collective emotion, noting that Sumlin’s spirit will be forever expressed in the musical gifts he gave to the world. Among the audience were numerous artists and music industry notables, reuniting and exchanging tales from back in the day. From my limited vantage point at the front of the room, I caught glimpses of Adam Gussow, Hook Herrera, Gene Cornish, Tony Brooks, and Shamekia Copleland and her band, who were invited to sing a few tunes at the end of the program (featuring her guitarist and inductee, Arthur Neilson) to the audience's delight. 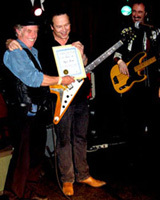 Richie Scarlett was on the scene to offer his congratulations to long-time friend, Perry, as was guitarist and co-honoree, Michael Hill. Perry’s band members, Jim Moran, Fred Clark, Ed Train and Bobby Fusco, also each offered anecdotes and happy returns. 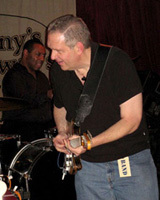 The house band for the event included Bob Fusco (bass), Dave Keyes (keyboards), Barry Harrison (drums), Scott Lebish (drums), Jim Moran (guitar), and Fred Clark (guitar). I would be remiss if I failed to mention the roster of great musicians who varyingly with the house band, provided accompaniment. 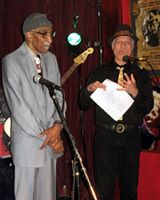 Following the BHF presentation to Honeyboy Otis, a set was performed in his honor by Robert Ross on guitar, Keyes, Fusco, Moran, and Harrison, featuring Otis’ hit tune, The Last Clean Shirt. Robert Ross’ set featured Steve Holly on drums and Dave Hofstra on bass. Carl Lorentzen played bass; Eric Heilner, keyboards, and Matt Mousseau, drums with Arthur Neilson. Harp player, David Barnes, was featured with Michael Powers. The house band backed up both Big Ed Sullivan and Roxy Perry, including Ed Train on keyboards for Perry’s set. 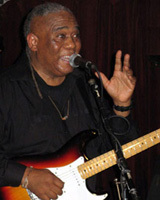 Accompanying Michael Hill were Dave Keyes, Mike Griot on bass, and Bill McClellan on drums. Keyes again played with Ivan Bodley and Angel Rissoff, along with Arthur Neilson on guitar and Scott Lebish on drums. 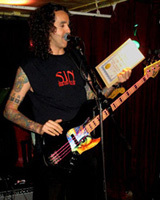 A 50/50 raffle was run, and a Fender Squire guitar, autographed by numerous artists, was generously donated by honoree, Michael Powers, to help raise funds needed to cover the event, and incredibly… yours truly was the lucky winner of the guitar! What a way to end an afternoon of good vibes and great music! I was thrilled to be part of the audience at Kenny’s Castaways to witness the happiness and pride shared by these truly legendary New York artists. Thanks to Kenny’s Castaways for generously allowing use of their fabulous room, and to event organizer and host Roxy Perry, along with her band members, Jim Moran, Fred Clark, Bob Fusco, Ed Train and Scot Lebish. Thanks again to Michael Powers for the donation of the autographed Fender Squire guitar, and to all the volunteers who assisted in managing a successful and fun event: Topsy Durham, Nancy Levine, Pat and Kristine Dougherty, Ed Train, Michael Packer, along with Jim Moran and Fred Clark, who did double-duty as members of the house band for the event.